​Please see below for some commonly asked questions about the GLCOF spring 2019 fundraising campaign. Q: The email set up in SportFunder is mine. Am I supposed to set up the account for me or my daughter? A: While the address linked to Sportfunder.com is likely yours and not your daughters, go ahead and set up the page for how it works best for you. So far, most have crafted their page for their Fury player’s name. You could also set it up under your family’s name. Q: I have multiple Fury players. How much are we supposed to raise and should each one have their own page? A: Ideally, we want every Fury player to raise at least $127. You can set up one family account and then under STEP 5/Campaign above set your goal at $127 x the amount for Fury players in your household. ($254 for 2 players, for example) If you have children who would like to each have their own page, you will need to have a separate email for each. Q: My family does not have social media accounts. Is there still a way for my daughter to participate? A: YES! This is an email-based fundraising system that also allows for social media linking, so you can email as many contacts as you like without posting to social media. Likewise, you don’t have to email and can share your fundraising 100% on social media, or use both email and social media. It’s up to you! Q: Under CAMPAIGN and SETTINGS, there is a tab to set up financial information. Do I link my financial information? A: Please do not add any personal financial information to you profile! All donations collected through your daughter’s page are directly routed to the Girls Lacrosse Club of Frisco account. Q: I hate technology! 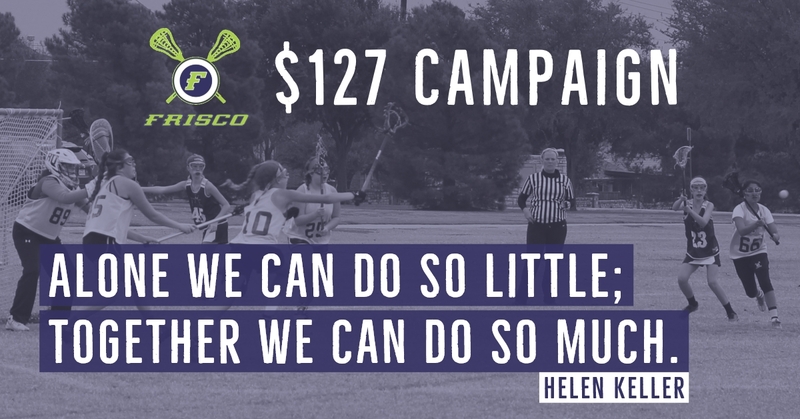 Can I just write a check for $127 to Girls Lacrosse Club of Frisco and skip this online fundraising? A: Yes you can. Please email treasurer@glcof.com and copy fundraising@glcof.com to indicate your family prefers to donate via a check. Make all checks payable to Girls Lacrosse Club of Frisco. Q: Who do I speak to about fundraising for Girls Lacrosse Club of Frisco? A: Please contact GLCOF board member in charge of fundraising, Chad Morris. Chad may be reached at fundraising@glcof.com and at 214-284-0998.